I sat there alone in the dark and prayed to a God I hadn’t spoken to in over 15 years. I begged Him to answer my burning questions. Am I the only one who is so lost? Why did my husband drink so much? Why do I continually make so many wrong choices when it comes to marriage? Why did my dad die such a horrible death? Dad started drinking shortly after I turned 15. That’s when my life slowly began to turn upside-down. For a young, impressionable, teenage girl who looked up to her strong father, I couldn’t understand why he was hiding vodka bottles and beer cans around the house. Even more so, I didn’t understand why Mom needed my help to find them and get rid of them. Had I done something wrong? Why was I being punished for this? The thought process of a child- everything was all about me. Mom was desperate to put an end to Dad’s drinking, so she would go to great lengths to make him stop. On one hand, she would do anything, including enlisting my help to pour the bottles down the sink and throw them away. On the other, she urgently pled with me and my sister not to make Dad angry and to keep the peace in the house. Did she not know getting rid of his vodka was not keeping the peace? Didn’t she realize that would only make him more upset to not have his stash to sip on as he sat alone in their bedroom? I didn’t know at the time but this back-and-forth chaos has a name; it’s called codependency. I learned over 20 years later exactly what the word meant. I know Mom only had love in her mind and heart as we emptied the bottles but the chaos likely contributed to the woman I am today. Maybe it was God’s plan all along? I often wondered why God didn't make a move while the last 20 years of my chaotic life happened. The answer came to me in the early morning hours in the darkness- I am chosen. Keeping silent and wallowing in my own misery was no longer an option for God. He had plans to redeem my past and create a new future. His new future for me would allow me to use my past to help others who knew all too well exactly how I felt. I was no longer alone in my pain. Not only do I have God but I also have others who share my heartache of living in an addicted household. Click to Tweet: Children who grow up in an alcoholic or addicted household often repeat the same lifestyle patterns. They either become addicts themselves or they marry addicts. I found myself in both situations. As I sat there in the dark, I recalled the events of my past: running away from home when I was 16; two broken marriages; my own addiction to cigarettes and shopping; depression and suicidal thoughts; and finally, my current marriage to an alcoholic. After Dad lost his battle with stomach cancer, I found myself intertwined with grief, anger and confusion. My husband was also an alcoholic. I found the courage to ask him to leave our home because I could no longer live in the chaos of addiction [Are you struggling to decide whether you need to make the leap of leaving your addicted loved one? Click to open, "When is the Right Time to Leave an Addict" in a new window!]. This, I believe, is exactly what God intended to happen. My husband and I were in God’s way, and He had some work to do - on both of us. I vowed I would stop this pattern. I felt completely alone until I cried out to God in my extreme brokenness. He answered. God gently picked up the shattered pieces of my broken heart and glued them back together with the blood of Jesus. God was the answer to all of my questions. While my husband and I were apart, God went to work removing our hearts of stone and replacing them with hearts of flesh (Ezekiel 36:26). God not only redeemed my past, but he also redeemed my husband’s alcoholism and our broken marriage. While my husband has been free from alcohol for over 2 years, we still go through the same marriage struggles couples often go through. The difference now is God. God is a redeemer (Ephesians 1:7), He is a healer (Psalm 30:2), and He is our Great Comforter (2 Corinthians 1:3-5). He understands our pain and suffering even more than we do because He suffered pain on our behalf so we could be free from the sins of our past - the ones committed against us and the ones we committed against God and others. I know I am not the only one who has suffered. There are others like me who know the effects of addiction [Yes! Join our community, "Colour Me Happy" (you know, when skies are grey). Click here to join! ], and there is a loving God who loves us all with a great love. Kimberly Dewberry struggled for 25 years to cope with an addicted parent. She knows first-hand how the serenity and peace of God’s redemption are keys to personal wholeness. Kimberly offers solid biblical truths to help transform women in the grace of a loving Heavenly Father. 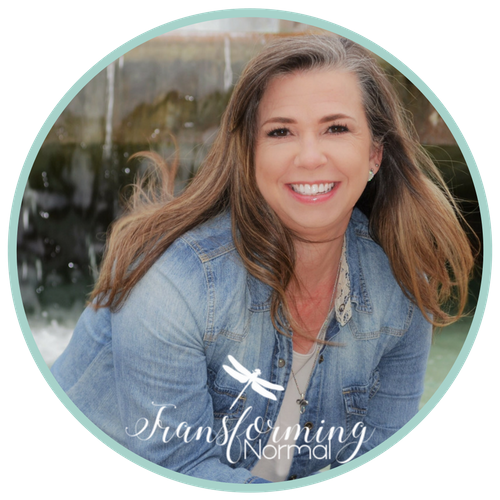 Her mission at her blog, Transforming Normal is to encourage and educate in order to serve those affected by addiction, alcoholism, and dysfunction in the family dynamic in such a way they would see the hope, healing, and freedom found in a relationship with Jesus Christ.